I’ve often downplayed the Microsoft-Apple rivalry. In large part this (my downplaying of the rivalry) is a reaction to the way that the mainstream tech press has, for nearly two decades, overplayed it. Apple and Microsoft are not direct rivals. Apple’s Macintosh business is built around selling computer hardware; their competitors in this market are companies like Dell and HP and Sony. Microsoft’s Windows business is built around selling operating systems to PC manufacturers; the only competition they face is from open source operating systems. But there’s no denying the fact that they are, for lack of a better term, orthogonal rivals. Windows and Mac OS always have been and will be compared against each other. The companies themselves are stark contrasts, as are their respective co-founders/leaders, Jobs and Gates. They produce software of almost completely opposite strengths and weaknesses. And, it seems to me, the two companies’ fortunes often seem to be at odds. Microsoft spent the ’90s growing from a successful software company into an industry-dominating titan. Apple spent much of the ’90s fighting the perception that it was on the verge of going out of business. So far in the ’00s, however, things have swung the other way. Apple is firing on all cylinders — the whole iPod/iTunes thing, Mac OS X, the so far very successful transition to Intel processors — and Microsoft… well, what is the deal with Microsoft? They’re certainly not doing poorly financially; they booked $3.89 billion in profit — profit! — in their most recent quarter. That’s more than $1 billion in profit per month, and an 18-percent increase over their profit from the same quarter a year ago. But their stock price dipped on the news, because analysts expected even more. Their stock, in fact, has been mostly flat since 2002, and other than a spike at the tail end of the dot-com boom, hasn’t moved much since 1998. At least from my perspective here on the Mac side of the fence, it just doesn’t look like Windows Vista is going to offer much, if anything, to make Mac users envious. This isn’t gloating. Quite the opposite, in fact. Another reason I’ve generally shied away from banging the Apple-vs.-Microsoft drum here on Daring Fireball is to avoid falling into the all-too-accurate stereotype of the Microsoft-bashing Mac enthusiast. I understand the urge to root against Microsoft, the urge to gloat over their problems, the desire to see them suffer in the market. But it won’t be good for Mac users if Vista turns out to be a dud. It might be good for Apple, but it won’t be good for Mac users. What would be good for Mac users is for Windows Vista to ship with innovative new features that are worth ripping off in a future version of Mac OS X. Put another way: the better Windows is, the more pressure Apple is under to improve Mac OS X. In the very worst tradition of punditry, allow me to make a sweeping generalization based on a few almost completely unrelated observations: Microsoft is suffering from a lack of confidence, and Apple is brimming with it. It is, admittedly, a cliché, but Microsoft is clearly a victim of its own staggering success. What they’ve done best, historically, is kill and/or neuter their competitors. That’s why they’re gearing up for a fight against Google; Microsoft, as a company, defines itself by its rivalries. They relegated early PC peers like WordPerfect, Lotus, and Borland to relative obscurity; then, famously, they outright obliterated Netscape. In the ’90s, to sell copies of Word, they needed to beat WordPerfect, and they did; to sell Excel, they needed to beat Lotus 1-2-3. Now, though, to sell new copies of Microsoft Office, they need to beat older copies of Microsoft Office. Hence the much-maligned ads in which Microsoft casts their own users as dinosaurs simply because they haven’t upgraded to the latest version of Office. Most of the criticism of these ads revolves around the fact that it’s a bad idea to insult your own customers. But what I found interesting about them is the tacit acknowledgment that Microsoft’s strongest competitor in today’s office software market isn’t OpenOffice, or any other competing suite from another company, but rather the Microsoft of a decade ago. The problem with Google, as an “enemy” for Microsoft, is that Google is even less of a direct rival to Microsoft than Apple is. Microsoft sells software. Google does not sell software. The only way for Microsoft to “beat” Google is for one of the two companies to enter the other one’s market. Google doesn’t seem the least bit interested in selling operating systems or office software — and even if they do eventually enter those markets, it would likely be with software they give away in order to generate advertising revenue. Microsoft’s previous corporate rivals were companies that helped Microsoft focus on its core competency: selling and developing PC software. Obsessing about Google draws them away from that focus. Welcome to the people_ready business. This ad epitomizes everything that’s wrong with Microsoft: they have nothing new to offer. There’s nothing wrong with branding ads; I like branding ads (e.g. Nike’s “Just Do It” and Apple’s “Think Different” campaigns). 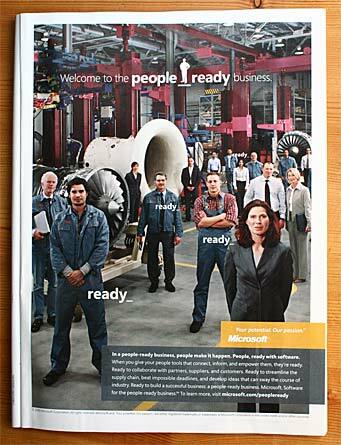 But if this “people_ready” ad is supposed to be about their brand, what is the message? The only message I can suss from it is “Buy Microsoft software just because it’s Microsoft software.” They would be better off running an ad that literally reads “No one ever got fired for buying Microsoft” — at least that would be bold. This ad is almost offensively timid. And “timid” is not a word normally associated with Microsoft — or any thriving company, for that matter. My point then was to emphasize how with the iPod, Apple is going for market share, not per-unit profits: iPods tend to cost less than comparable products from other companies. Rather than give the 14-inch iBook a higher-resolution display, it ran at the same 1024 × 768 resolution as the 12-inch iBook. You got bigger pixels instead of more pixels. iBook video cards were capable of desktop spanning with an external display, but without the use of unsupported third-party hacks, they only supported external displays to mirror the built-in display. iBooks were often significantly slower than PowerBooks. Not so with the new MacBooks. For $1099, you can get a MacBook today that’s almost every bit as good as the $1999 MacBook Pro that first shipped just three months ago. The differences between the MacBooks and MacBook Pros are simple and obvious: bigger screens, more ports and an expansion slot, backlit keyboards, and a different case finish. Other than for high-end video (and gaming, which today is more video-card-dependent than processor-dependent), performance is not a differentiating factor. MacBooks are fast. A more cautious decision would have been to equip the MacBooks with the slower Core Solo processor (as used in the Mac Mini), maintaining a similar relative performance gap between the MacBooks and MacBook Pros as there was between the iBooks and PowerBooks. I don’t see how anyone can doubt that there are many people who, if the MacBooks had shipped with Core Solo processors, would have bought a MacBook Pro but who will instead now buy a (cheaper, less profitable) MacBook instead. The $1099 MacBooks arguably offer the most bang for the buck in any Mac that Apple has ever shipped. Apple, it seems clear, is confident that they’re going to make it up in volume. I offer this juxtaposition between Apple and Microsoft simply as an interesting contrast. Confidence can lead to arrogance, both in individuals and in organizations, but I don’t see that happening with Apple today. It was arrogance in the ’80s when the Sculley regime maintained almost absurd profit margins on Macintosh hardware. Today, Apple’s confidence is leading them to lower their prices, not raise them. Maybe the lesson here is that you can’t make a billion dollars a month in profit with a simple line of simple products. What I’d like to think, though, is that the lesson is that good design can be good business. Microsoft, in contrast, plans to offer Windows Vista in seven different editions: Starter, Home Basic, Home Premium, Professional, Small Business, Enterprise, and Ultimate. The names read like something out of The Onion. Can anyone explain how this seven-tiered edition plan is good for anyone other than the managers within Microsoft’s bureaucracy? Microsoft is turning into a company that values management decisions that increase complexity over design decisions that increase clarity. Anyone who has read any modern management book (or lived in the trenches) [knows that] more people does not equate to more features. […] Vista isn’t neutered and delayed because of any lack of people. It is a mess because of middle management. In a large project, complexity is a logarithmic on connections. 3 projects is 2× as complicated as 2 projects…. roughly. It gets worse. At least at the time I left (6 months ago), I saw very little evidence that the management of these failed projects was getting any kind of a slap on the wrist. The problem is that in an org that large with that [many] dependencies, it was impossible to tell which team was actually mismanaged, and which team just was dragged down by the other mismanaged teams. This is how a company with so many talented programmers can spend six years developing an operating system that no one is excited about. That’s why it’s so hard for a company to break out of a slump induced by poor management: the only ones who can address the problem are the managers themselves.